WASHINGTON (CNS) — The service of the Apostolic Signature, the Catholic Church’s highest appeals court, “is intimately connected with the very apostolic character of the church,” U.S. Cardinal Raymond L. Burke told a Washington audience March 20. The prefect of the Supreme Court of the Apostolic Signature delivered the 11th annual James H. Provost Memorial Lecture at The Catholic University of America. A former archbishop of St. Louis, he was appointed to the post by Pope Benedict XVI in 2008. He was named a cardinal in 2010. The Apostolic Signature, in addition to hearing appeals of lower court decisions and administrative decisions by Vatican congregations, oversees the functioning of church tribunals and procedures. In his lecture, he addressed the relationship between the Apostolic Signature’s Supreme Court and the local church and its “various areas of competence” in relation to the local church. He also reflected on the process of annulments, which he noted will be one of the areas discussed at this October’s extraordinary Synod of Bishops. This service “is ordered to the ‘unity of discipline,’ which requires not only a Supreme Tribunal to decide cases of legitimacy, but also a department of justice to safeguard and promote the correct administration of justice in the universal church as well as the particular churches,” he said. These matters are diverse, he said, including, for example, recourses against dismissal of a religious, transfer of a parish priest, restriction of priestly ministry, removal of ministerial faculties, renovation of a parish church and dismissal from a teaching position. The faithful who seek recourse can be assured their case “has been heard by the highest judicial authority in the church, exercising vicariously the power of judgment of the Roman pontiff, even if the final decision is not what they had desired,” Cardinal Burke said. “The judicial process and the final decision bring resolution and eventually, one hopes, peace to individuals and institutions of the church involved in difficult and often prolonged conflicts,” the cardinal added. The advocates of those seeking annulment must present evidence that the marriage was null from the beginning; the defender of the bond, on the other hand, seeks to prove that an indissoluble marriage bond exists. The Apostolic Signature solicits annual reports on the status and activity of more than 1,000 individual diocesan and interdiocesan tribunals throughout the world, Cardinal Burke noted. The reports show whether the tribunal in question “has sufficient and properly qualified staff to handle the number of causes of nullity of marriage submitted to it for judgment,” Cardinal Burke explained. The Apostolic Signature also is “able to see the grounds of nullity on which the causes are judged, and to make appropriate inquiries about the jurisprudence followed at the tribunal,” he added. “The goal is that each particular church … have a tribunal in place which is accessible to the faithful and which receives their petitions promptly and judges them according to the sound teaching and procedure set forth in the church’s discipline,” he said. He added that if there is to be “any simplification of the process of nullity of marriage,” it must be studied in light of the Apostolic Signature’s service to the individual churches. 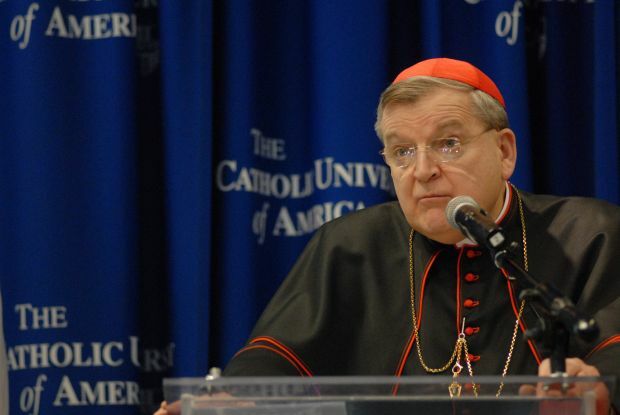 The full text of Cardinal Burke’s lecture will appear in an upcoming issue of The Jurist, a journal published by The Catholic University of America Press. According to the university, it is the only scholarly peer-reviewed journal on canon law published in the United States. Its editorial office is housed within Catholic University’s School of Canon Law.